Seventeen students from the Ateneo Law School participated in Ateneo Human Rights Center (AHRC) Sembreak Internship Program, sponsored by the Friedrich Naumann Foundation (FNF). The interns underwent the Basic Orientation Seminar from October 30 to November 3 at the Splash Mountain Hotel, a six-day immersion at Oriental Mindoro, and the program culminated in the Evaluation/Rest & Recreation at Puerto Galera, Mindoro. The Internship Program of the Ateneo Human Rights Center (AHRC) is designed to expose law students and graduates to the plight of vulnerable sectors of society and to provide training on human rights advocacy or alternative lawyering. “We hope that eventually, we can consolidate the concerns of the marginalized and develop way how to properly address them,” said FNF Resident Representative, Mr. Siegfried Herzog. During the Basic Orientation Seminar, the participants were presented with the specific human rights concerns with the help of guest speakers who are experts in their fields. Aside from the lectures, the interns actively participated in the workshops on interviewing clients, giving paralegal training sessions and on affidavit making. There were also group activities and session which aimed to promote unity and camaraderie between and among the participants. 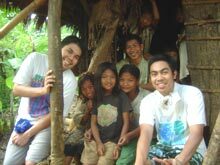 For the immersion, the interns went to San Mariano, Oriental Mindoro to live with the Mangyans. “We want the interns to directly experience grassroots poverty and learn about the issues affecting vulnerable groups. The immersion will further deepen their understanding of the marginalized,” expressed AHRC Internship Director Atty. Lovely-Ann Carlos. During the Immersion proper, some participants were able to use the skills they learned during the Basic Orientation Seminar and conducted paralegal training seminars and group discussions which educated the Mangyans on their rights over their ancestral land. The Sembreak Program ended with an evaluation, where the interns were guided in processing their experience.